Surprise baby shower event, photographed at Le Meridien Delfina in Santa Monica, designed by Deanna Tat of Chic Ambiance and Nam Lam of Modern Los Angeles Weddings. 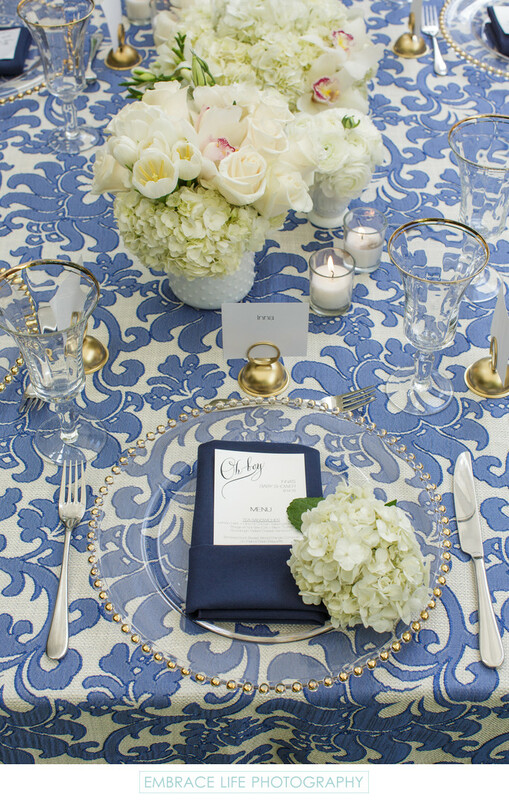 The gorgeous place settings, from Classic Party L.A., set upon on a blue and white patterned linen by Luxe Linen, include crystal dishes trimmed in gold beads, gold trimmed goblets, and name cards in gold place card holders. On the plate is a blue linen napkin holding a menu with the title, "Oh Boy" for this surprise baby shower. Vintage white hobnail vases hold a variety of white flowers, designed by Butterfly Floral, including hydrangea, tulips and roses. Keywords: Details (1125), Event Photography (384), Flowers (471).